2x Points, Seniors Day, Friday Night Fever and more. The games go on and on. Pick a day to play and you won’t be disappointed at Vernon Downs Casino Hotel. We offer spectacular gaming promotions not only offering you a chance to win big money but you could also win, a TV, computer, even a brand new car! Stop by Vernon Downs Casino Hotel today and see what games you could be playing. One winner every hour from 5pm-10pm. Winner will select a Cash Cow and break it open to reveal their prize from $200 to $1,000 CASH! Cash Cows worth $500 to $2,500 from 5pm-10pm and one winner selected for $5,000 at 11pm! Earn 5x entries every Monday. Earn one entry for every 5 base points earned while playing with your Players Card beginning on 4/1/19. Entry activation begins at 4pm every Saturday. Entry activation for 11pm drawing on April 27 begins at 10pm. Digital entry ticket activation will begin at 4pm each Saturday. Players Club members must activate all available entries for the drawing by carding in and having activity on their Players Card as of that time. On Saturday, April 27, 2019 for the grand finale drawings activation for drawing entries will begin at 4pm and will be applicable to the 5pm-10pm drawings. For the 11pm drawing only Players Club members that have activated their entries after 10pm will be eligible for the drawing. Players Club members begin earning entries at 9am on Monday, April 1, 2019. Digital entries are earned one digital ticket for every 5 base points earned on players card. All entries earned throughout the month will accumulate all month long and will be eligible for any drawing for which the guest has activated their players card and entries. On Monday’s in April, Players Club members may earn 5x entries into the drawings from 9am to 2am. VIP guests will be sent a postcard or e-blast with 1,500 bonus entries valid only on the night of the grand finale. The postcard or e-blast must be brought in and presented either to a host or the Players Club in order to receive the bonus entries. Drawings will take place each Saturday. One winner will be selected at each hour and given three minutes to report to the promotional area located in front of the Players Club. If the selected winner does not respond within the three minute time frame, another winner will be announced and this process will continue until a winner is present and has been verified. Once the winner is verified they will be asked to step into the promotional area and select one of the available cow piggy banks. Six cow piggy banks will be available on each regular drawing day, once a cow piggy bank has been chosen and broken only the remaining cow piggy banks will be available to choose from for subsequent drawings that night. The winner chosen will then put on a face shield and gloves for protection. The selected cow piggy bank will be placed into a box and the winner will be asked to break open the bank to reveal a prize slip listing the cash prize won. Prizes available will be: $200 cash (3), $400 cash (1), $500 cash (1), and $1,000 cash (1). A total of $2,500 in cash prizes will be available on each Saturday April 6, 13 and 20, 2019. Guests may only win once per day April 6, 13, and 20, 2019. On Saturday, April 27, 2019 the Cash Cow Moo-Lah drawings will end with a Cash Cow Stampede! On this night only drawing amounts will increase and there will be drawings taking place each hour from 5pm to 11pm. For the 5pm to 10pm drawings the following prizes will be available in the cow piggy banks: $500 cash (2), $1,000 cash (2), $2,000 cash (1), and $2,500 cash (1). As noted above, once a cow piggy bank has been broken and the prize revealed only the remaining prizes will be available for subsequent drawings that night. At 11pm one winner will be selected to win a $5,000 cash grand prize (no cow piggy bank to be broken). Entries for the 11pm drawing only on Saturday, April 27, 2019 must be activated after 10pm. Guests may only win one of the drawings between 5pm-10pm on April 27, 2019. All guests with earned entries that have activated said entries after 10pm are eligible for the $5,000 grand prize at 11pm on April 27, 2019. A total of $12,500 in cash prizes will be available on April 27, 2019. Guests must be a member of the Players Club and abide by all club rules to be eligible to participate. Use of Players Card is required to generate earned entries and to activate earned entries on each drawing night as prescribed in the above promotional rules and details. Excluded/evicted patrons cannot participate in promotions. Vernon Downs may disqualify any participant for any prize based upon fraud, dishonesty, violation of these official rules or other misconduct whether or not related to this promotion. Must be present to collect prize at drawing time when name is announced. Guests may only win once per promotional day with exception to April 27, 2019. It is the responsibility of each participant to be aware of casino announcements for the promotion. Prizes for this promotional giveaway are in cash form only. Prizes may not be converted to free play or any other form of payout. Must present a valid State/Federal valid photo identification before physical, monetary, or free play prize, award, or offer can be claimed. By participating in the promotion, each participant agrees to and acknowledges that they will abide by the official rules, regulations and procedures of the promotion. Taxes are the sole responsibility of the Club Member. Each winner shall hold harmless Tioga Downs, Vernon Downs, and any affiliated company, the State of New York, and any agents, officers, employees against any damage, loss, claim or liability arising from participation in this promotion. Each prize winner grants the right to use their name, city of residence, and photograph in order to publicize their winnings. Street address and phone numbers will not be released for publicity. Any valuation of the prize(s) stated awarded in this contest is based on available information provided to Tioga Downs/Vernon Downs from the provider, and the value of any prize awarded to a winner will be reported for tax purposes as required by law. Each winner is solely responsible for reporting and paying any and all applicable taxes related to the prize(s) and paying any expenses associated with any prize which are not specifically provided for in the official rules. Each winner must provide the Company with valid identification and a valid taxpayer identification number or social security number before any prize will be awarded. Any person winning over $600 in prizes from the Company will receive an appropriate IRS form 1099 at the end of the calendar year and a copy of such form will be filed with the IRS. All Lottery Key License holders and employees of the NY State Gaming Commission, Vernon Downs, Tioga Downs, New York Lottery, Bally Technologies, Spielo, IGT, SDG and/or Multimedia Games and/or any subsidiaries or affiliates, their spouses, siblings, children and/or other dependents living in the same residence are not eligible to win. Offer void where prohibited or restricted. If for any reason this promotion is not capable of running as planned, including infection by computer virus, bugs, tampering, unauthorized intervention, fraud, technical failures, or any other causes within or beyond the control of Vernon Downs, which corrupt or affect the administration, security, fairness, integrity, or proper conduct of this promotion – Vernon Downs reserves the right at its sole discretion to cancel, terminate, modify or suspend the promotion. Management reserves the right to cancel, change or modify the promotion without notice. In the event of a dispute, decisions of management will be final. For names of winners, available at the conclusion of the promotion, send a stamped, self-addressed envelope to: Marketing Department, Vernon Downs Racetrack LLC, 4229 Stuhlman Rd, Vernon, NY, 13476. Every Day! All month long in April and May. Amazon Fire Tablet or a Smart TV! Five winners will be selected to win $100 cash and one to win $500 cash. All entries earned throughout the month are eligible for cash giveaway! Beginning April 1, 2019 the Social Media Coordinator will post a Vernon Downs Code of the Day on the Vernon Downs Facebook Page. Each word, each day will be different than any previous word or phrase used. Guests that see the word on Facebook and want to participate must come into Vernon Downs on the date the word was posted, visit the Players Club during regular operating hours, and show the players club representative the code on their phone and proof that they “like” the Vernon Downs Facebook page. All participants must either be players club members or join the club. Once the code is verified, the Players Club Rep will fill out a manual entry ticket (business card sized) with the person’s name, account number, and entry date. At that point the player’s account will be tagged to prevent double entry on the same day. The manual ticket will then be placed into the drawing drum. Every Friday in April and May we will select five winners from the manual drawing drum. Winners may only win once per week but may win multiple times during the two month promotion. Drawings will take place in front of the players club each Friday night at 9:30pm. The Social Media Coordinator will record the drawing as it takes place with the person drawing names one at a time and announcing the winner and the prize they’ve won. If a person is drawn a second time we will set their ticket aside and draw again. Once a ticket is drawn it will remain out of the drum until the final day drawings on Friday, May 31, 2019 (guests participating more than once and having more than one entry will be eligible to win every week provided they have tickets in the drawing drum). If a person is drawn twice during a regular Friday drawing their second or subsequent drawn entry will be placed back into the drum for the remaining drawings during the month (their initial winning ticket will remain out). At the completion of the Friday 9:30pm drawing the Social Media Coordinator will post the video to our Facebook page with copy outlining the winners and prize they won. Announcements will be made live in the casino as the drawings occur to promote participation and in the event a winner is present in the casino. Winners chosen through the Facebook drawing will be given 7 business days from the date of the actual drawing to come in and claim their prize at the Players Club. The Players Club Rep will refer to a drawing tracking sheet and verify the ID and account number of the winner. The winner of the prize will fill out a 1099 and any other related paperwork before the prize is handed over. Winners do not need to be present at drawing time to win. On Friday, May 31st we will conduct a grand prize drawing at 9:30pm using all of the same methods for previous Friday drawings. All previous winners’ entry tickets will be placed back into the drum and eligible for the cash grand prizes. There will be six total drawings all for cash. Winners in these drawings may only be selected for one cash prize. There will be five prizes of $100 cash each and one prize of $500 cash. Cash drawings will total $1,000. On this day there will be no property specific or electronic merchandise prizes given away. Winners chosen on this day will be given 7 business days to claim their prize at the players club anytime during regular operating hours. Should any cash prize go unclaimed it will not be re-awarded and it will not be held over for any future Facebook promotion. • Must be 18 years of age or older to participate. • Must be a member of the Players Club or join the club and abide by all club rules to be eligible to participate. • Must show proof of “liking” the Vernon Downs Facebook page. • In order to participate, guest must appear in person at the Players Club during regular daily operating hours to show that day’s word of the day in order to receive a drawing entry. Comments, messages or any other correspondence through the Facebook page or otherwise not in person at the Players Club will not qualify for entry. • Vernon Downs may disqualify any participant for any prize based upon fraud, dishonesty, violation of these official rules or other misconduct whether or not related to this promotion. • It is the responsibility of each participant to be aware of casino announcements for any promotion. • Prizes won may not be exchanged for a different prize, cash, free play, or any other form of award. • Once the seven day prize claim period has expired, the winner will no longer be eligible to claim prize won. • Must present a valid State/Federal valid photo identification before physical, monetary, or free play prize, award, or offer can be claimed. • By participating in the promotion, each participant agrees to and acknowledges that they will abide by the official rules, regulations and procedures of the promotion. • Taxes are the sole responsibility of the Club Member. • Each winner shall hold harmless Tioga Downs, Vernon Downs, and any affiliated company, the State of New York, and any agents, officers, employees against any damage, loss, claim or liability arising from participation in this promotion. • Each prize winner grants the right to use their name, city of residence, and photograph in order to publicize their winnings. Street address and phone numbers will not be released for publicity. • Any valuation of the prize(s) stated awarded in this contest is based on available information provided to Tioga Downs/Vernon Downs from the provider, and the value of any prize awarded to a winner will be reported for tax purposes as required by law. • Each winner is solely responsible for reporting and paying any and all applicable taxes related to the prize(s) and paying any expenses associated with any prize which are not specifically provided for in the official rules. Each winner must provide the Company with valid identification and a valid taxpayer identification number or social security number before any prize will be awarded. Any person winning over $600 in prizes from the Company will receive an appropriate IRS form 1099 at the end of the calendar year and a copy of such form will be filed with the IRS. • All Lottery Key License holders and employees of the NY State Gaming Commission, Vernon Downs, Tioga Downs, New York Lottery, Bally Technologies, Spielo, IGT, SDG and/or Multimedia Games and/or any subsidiaries or affiliates, their spouses, siblings, children and/or other dependents living in the same residence are not eligible to win. Offer void where prohibited or restricted. • If for any reason this promotion is not capable of running as planned, including infection by computer virus, bugs, tampering, unauthorized intervention, fraud, technical failures, or any other causes within or beyond the control of Vernon Downs, which corrupt or affect the administration, security, fairness, integrity, or proper conduct of this promotion – Vernon Downs reserves the right at its sole discretion to cancel, terminate, modify or suspend the promotion. • Management reserves the right to cancel, change or modify the promotion without notice. In the event of a dispute, decisions of management will be final. • For names of winners, available at the conclusion of the promotion, send a stamped, self-addressed envelope to: Marketing Department, Vernon Downs Racetrack LLC, 4229 Stuhlman Rd, Vernon, NY, 13476. Supplies are limited. Gifts may vary from picture shown. No rainchecks or substitutions. Prize must be claimed during promotional times. Each water conservation kit includes: 1 handheld showerhead, 1 garden hose nozzle and 1 kitchen faucet swivel aerator. Each electricity conservation kit includes: 4 LED light bulbs and 2 LED nightlights. Players Club members must use their Players Card while gaming during the times of the promotion to be eligible to receive the gift. Only base points earned between 12pm and 9pm on the dates of the promotion will be applicable to the earning requirement. Once the required base points have been earned the Players Club member must go to the Players Club to receive their gift. Players Club members must collect their gift at the players club before 9pm each promotional day. Earn and Get Gifts are available only while supplies last on a first come, first earned basis. There will be no rainchecks, substitutions or special offers in the event any gift runs out. Guests must be a member of the Players Club and abide by all club rules to be eligible to participate. Use of Players Card is required and must be used and properly inserted while gaming in order to accumulate points and to be eligible to receive the Earn and Get gift. Earn and Get prizes/gifts may not be exchanged for cash or free play in lieu of the prize. Guests must collect their prize on the date of the promotion and prior to the end of the promotion (9pm each day). Earn and Get Gifts are available only while supplies last on a first come, first earned basis. There will be no rainchecks, substitutions or special offers in the event any gift runs out. Look for your favorite IGT or Spielo gaming machines featuring the Play Me sign or wobbler and win CASH prizes! One hot seat winner every hour. Six winners per day! – 5pm-8pm: Each winner wins $250 cash. – 9pm-10pm: Each winner wins $500 cash. – 9pm: one winner of $1,000 cash. – 10pm one winner of $2,000 cash. Must be playing on qualifying IGT or Spielo games with Player’s Card at drawing time to be eligible to win. On Fridays in April 2019 (4/5, 4/12, 4/19, and 4/26) active Players Club members who are playing any IGT or Spielo game will be eligible to win cash drawings via random computer generated “hot seat” selection. One winner will be chosen each hour. Winners chosen will be announced over the casino microphone and asked to report to the Players Club within three minutes to claim their cash prize. If a selected winner fails to report to the Players Club within the allotted three minute claim period another winner will be selected and announced. This process will continue until a valid winner has been selected and verified. Guests may win up to twice per promotional day. Only IGT or Spielo branded games are eligible for this promotion and will be designated by wobbler affixed to the machine and/or slot topper above the machine. • Must be 18 years of age or older. • Guests must be a member of the Players Club and abide by all club rules to be eligible to participate. Use of Players Card is required to be eligible for random hot seat selection. • Must be actively playing on an IGT or Spielo branded game with Players Card inserted to be eligible for random hot seat selection. • Excluded/evicted patrons cannot participate in promotions. • Must be present to collect prize at drawing time when name is announced. • Guests may win up to twice per promotional day. • It is the responsibility of each participant to be aware of casino announcements for the promotion. • Prizes for this promotional giveaway are in cash form only. Prizes may not be converted to free play or any other form of payout. Bonus drawing entries applicable to current monthly promotion only. Limited to three maximum swipes per day. See Player’s Club to verify points and to receive swipe. On Mondays in April (excluding April 29, 2019) from 9am to 12am (midnight), Players Club Members will have an opportunity earn up to three swipes on the kiosks to play the Magic Monday Kiosk game and win up to $200 in free play. Players Club Members will earn one free swipe for every 150 points earned while using their Players Card. Swipes will be limited to a maximum of three per promotional day, per club member. In order to receive their swipe/s, the Players Club member must visit the players club to have their point earnings for the day verified and then they will be tagged into the applicable available swipe for that day. Once being tagged in the system by a Players Club representative the club member will then visit a kiosk of their choice to swipe their Players Card and play the game. Once a players club member has reached their maximum of three swipes per day, they will not be eligible to participate in the promotion for the remainder of that day. Once a prize is awarded on the kiosk it will not be replaced until the following Monday. • Must be a member of the Players Club and abide by all club rules to be eligible to participate. Use of Players Card is required to earn points and be eligible to receive free kiosk swipes. • Bonus drawing entries that are won through the Magic Monday Kiosk Game in April 2019 are only eligible for the $20,000 Cash Cow Moo-Lah Drawings occurring on Saturdays in the month. In order to participate in the $20,000 Cash Cow Moo-Lah Drawings, guests must be present on those dates to activate all earned entries (regular, multiplied, and bonus) to be eligible to win in those drawings. • Food credits won through the Magic Monday Kiosk Game will be valid for 30 days from issuance. 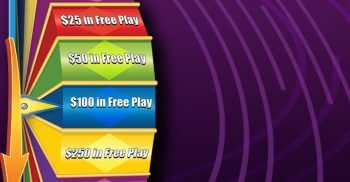 • Free play won through the Magic Monday Kiosk Game will be valid until the end of the gaming day on 4/30/2019. • Once expired, prizes may not be re-issued. $5 Lunch or Dinner Buffet at Champions. Win Your Age Hot Seat Drawings. Two winners every hour from 12pm to 4pm. If you’re drawn, you’ll win your age in CASH! Must be a Player’s Club member to participate. On Tuesdays and Wednesdays in April, Players Club members aged 50 or older (seniors) will receive special benefits and drawing opportunities. Hot seat drawings will be conducted by the Players Club every hour from 12pm to 4pm using the Casino Marketplace system and Hot Seat Internal Controls. At each drawing time two winners will be selected. Prior to the announcement of winners, their age will be verified by their documented birthdate in the system and again upon claiming their prize through ID verification. Winners announced will be given three minutes to make their way to the Players Club to claim their cash prize. Selected winners must present a valid State/Federal photo identification before prize can be claimed. Verified winners will receive the amount of their age in cash. Members will only be eligible to be drawn to win one cash prize per day. If a chosen winner does not respond within the allotted three minutes, there will be no alternate winners drawn (only two winners will be selected at each hour whether claiming or not) and they will be ineligible for the day’s remaining drawings. Must be a member of the Players Club and abide by all club rules to be eligible to participate. Use of Players Card is required to be eligible for hot seat “win your age” drawings. Prizes for the “win your age” drawings are in cash form only. Prizes may not be converted to free play or any other form of payout. Playing late has its perks! Every Friday night earn triple points on your Player’s Club card! All Players Club (Your Club) members will receive 3x points while playing on their Players Cards from 8pm to 2am every Friday in April 2019 and also from 12pm to 8pm on Monday, April 29, 2019. The Players Tracking System will automatically triple the amount of earned base points on eligible Players Club accounts during the promotional period. Must be using a Players Club card while gaming to participate in promotion. Excluded patrons cannot participate in promotions. Must be present during prescribed dates and times of promotion to receive point multiplier. Must present a valid State/Federal photo identification before physical, monetary, or free play prize, award, discount, or offer can be claimed. Management reserves the right to cancel, change or modify the promotion without notice. In the event of a dispute, decisions of management will be final. Each winner is solely responsible for reporting and paying any and all applicable taxes related to the prize(s) and paying any expenses associated with any prize which are not specifically provided for in the official rules. Each winner must provide the Company with valid identification and a valid taxpayer identification number or social security number before any prize will be awarded. Any person winning over $600 in prizes from the Company will receive an appropriate IRS form 1099 at the end of the calendar year and a copy of such form will be filed with the IRS. For names of winners, available at the conclusion of the offer, send a stamped, self-addressed envelope to: Marketing Department, Vernon Downs Racetrack LLC, 4229 Stuhlman Rd, Vernon, NY, 13476. New Members Spin to Win! Spin to Win for your chance to win up to $250 in free play. Every New Member is a winner! New Players Club members will receive one opportunity to play the Spin to Win Kiosk Game after earning 10 base points on their Players Club card. The kiosk game wheel will include: $250 free play (1), $100 free play (2), $50 free play (10), $25 free play (100), and $10 free play (1,407). Once the new Players Club member earns 10 base points during the promotional period they must return to the Players Club in order to have the game activated. The promotional offer is valid on the Players Club account until the player uses the offer or the offer is discontinued. Any player that has been tagged as inactive for three years or more may also participate in this promotion but must make the request at the Players Club and earn the required 10 base points to be eligible. Once a prize amount is awarded on the kiosk it will not be replaced until the start of the next promotional period (month). Guests must be a new Players Club member or have been inactive for three years or more to be eligible to receive the offer. Guests may only receive this offer only once in the lifetime of their account. Offers are valid once the guest earns the required points and is tagged in the system. Offers remain valid until used by the guest or until the promotion is discontinued. Unused, discontinued offers/promotions will not be replaced. It is the responsibility of the guest, upon joining the Players Club, to ensure that a valid mailing address is provided in order to receive any mail offer. Use of Players Card is required and must be used and properly inserted while gaming in order register play on the player’s tracking system. It is the responsibility of each participant to be aware of casino announcements for any promotion. Free Play vouchers are non-replaceable and non-exchangeable. Must present a valid State/Federal valid photo identification before physical, monetary, or free play prize, award, or offer can be claimed and to join the Players Club. Must be 18 years of age to play video gaming machines. Please play responsibly.